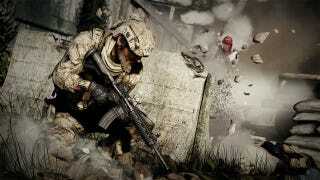 Throughout the lead-up to its launch, Medal of Honor: Warfighter touted its authenticity as a modern-day military shooter. Over the course of its production, it consulted heavily with real-life Navy SEALs, in order to make missions more realistic. The authenticity, unfortunately, didn't help the game, and now it turns out its hurting the SEALs too. CBS reports that seven members of SEAL team six have been disciplined for revealing secrets while consulting on the game. According to CBS, "while serving as consultants for the game, they used classified material which had been given to them by the Navy." SEAL team six became famous for successfully executing the raid in which Osama bin Laden was killed at his Pakistan compound in May, 2011. The seven, who are still on active duty, have all received letters of reprimand and are on half pay for two months. Four other members of the team, who have since transferred out of the unit but remain on active duty elsewhere, are also under investigation. The SEAL team is also featured in the upcoming film—and Warfighter DLC—Zero Dark Thirty.